I was going through some 2011 photos and found this. 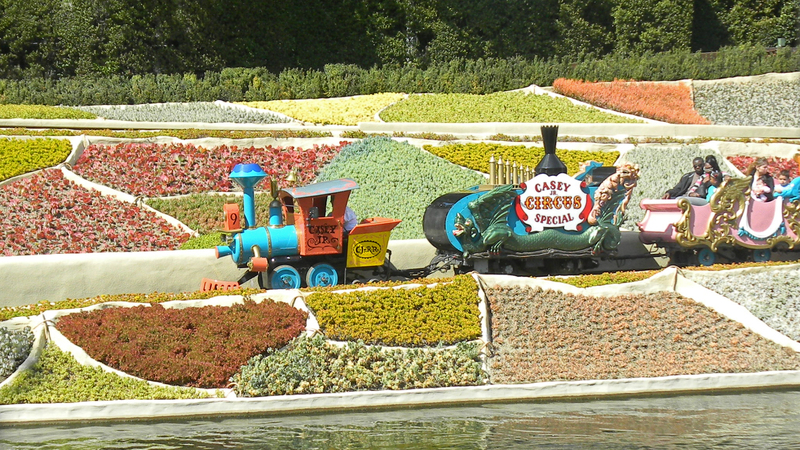 The Casey Junior Train is the best thing in Disneyland (there isn’t one at Disney World). It epitomizes everything I wanted to visit at Disney theme parks when I was young, and it is pretty much all that is left of the Disney magic that I can embrace. I didn’t really want to go to Disneyland (crowds, lines, heat) but my son was hell bent on seeing this train, and he was right – it’s the coolest thing there. I’m amazed that the Disney merchandising juggernaut has not capitalized on the train mania – aside from a pin, you cannot find any models or memorabilia related to this train anywhere in Disneyland. I’m not complaining (okay maybe I am) but it’s so discouraging when you can buy princess everything and Goofy sweatshirts in size XXXL but not a toy train. And you know what else I love about it? See the patchwork quilt that makes up the landscape? 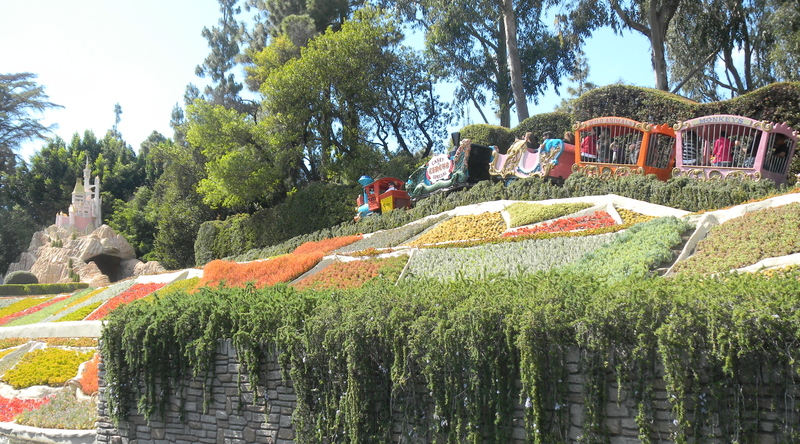 Those are all succulents, planted by Walt Disney himself, in every hue imaginable. Oh, and my boys rode around in the monkey cage. I loved that, too. I couldn’t agree with you more. Last time I was at Dland some of the cast members told me that all decisions on Merchandising items had to come from Florida. That still does not help the consumer does it. I guess perhaps writing to them could give you a better answer. The Casey Jr. and Storybook ride inter mingle somewhat, Casey skirts all around Storybook I’m not sure which came first I think Casey. I am like you, I want more Casey Merchandise.